Atlanta Memorial Park Conservancy's mission is to restore, enhance, and preserve Atlanta Memorial Park, making it a beautiful, connected, and sustainable urban greenspace for the enjoyment of all. Are you enjoying the new PATH around the golf course? Do your children/grandchildren love to go to the playground tucked in and among the trees? Would you like to see Memorial Park receive a wildlife sanctuary certification? How about the improvements to the sewer infrastructure in the park? And we can't forget the monthly forest restoration projects and ongoing creek clean-ups. These are just a few of the things that AMPC is leading and working on with park partners including the City of Atlanta, PATH Foundation, Trees Atlanta, Chattahoochee Riverkeeper, Park Pride, Atlanta Audubon Society and others to make our park better. 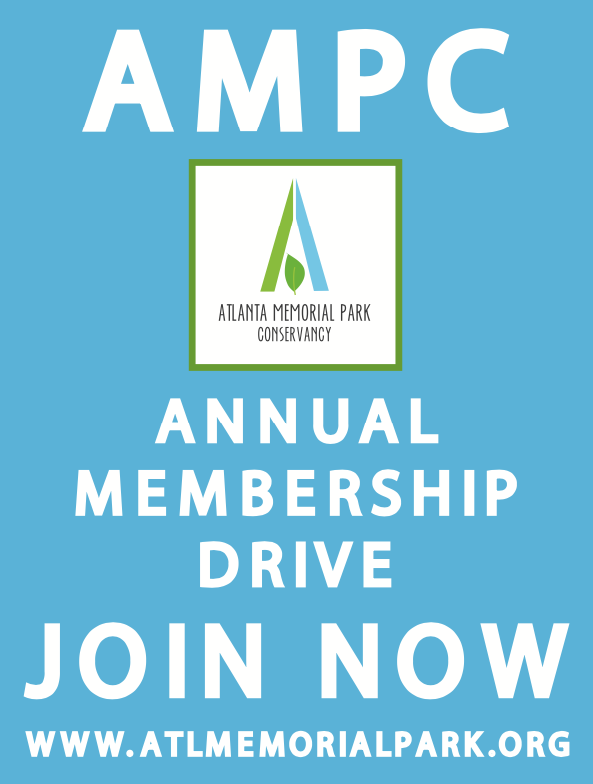 If you believe in the work AMPC and our partners are doing in the park, please renew your commitment to AMPC. If you've already given, thank you! If you haven't had a chance to donate yet, please take a few minutes to support AMPC by clicking on the link below. What's happening in the park? Forest Restoration Projects: (October 30, 2018) Thanks to Xylem for bringing their employees to the park to remove ivy from trees and invasive privet along the new PATH on Woodward Way. They were a hard working and enthusiastic group of volunteers! 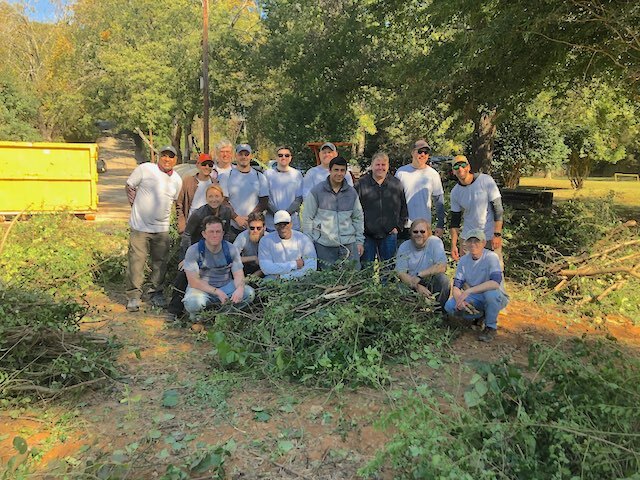 (October 10, 2018) Thanks to the volunteers and Trees Atlanta green t-shirt volunteer, Aaron Bose, for continuing to remove invasive plants near the old playground in advance of our December 1 planting day. Bird Walk: (October 28, 2018) Thanks to Atlanta Audubon Society birder, Bill Lotz, for leading the Bird Walk. Among the birds identified that day were a Black-throated Green Warbler, Red-shouldered Hawk, Brown Thrasher, and Red-bellied Woodpecker. For the complete bird list, visit the eBird checklist here. Peachtree Creek Clean-up Day: (October 5, 2018) Thanks to the Chattahoochee Riverkeeper and Cox Enterprises for bringing more than 70 volunteers to the park to clean up Peachtree Creek and remove invasive plants along the new PATH on Woodward Way. This amazing group collected 1.5 TONS of trash and recycling plus 16 tires and removed ivy from trees and invasive privet along the new trail. More trees for the new PATH along Woodward Way: (Coming soon) Thanks to the PATH Foundation and Alec Michaelides, AMPC member and Haynes Manor neighbor, for identifying areas to plant additional trees between the new PATH on Woodward Way and Peachtree Creek. A total of 30 additional trees will be planted in the coming weeks. New tree planting of GDOT trees along Northside Drive: (Coming soon) Thanks to the ongoing efforts of the City of Atlanta, GDOT, Bobby Jones Golf Course Foundation, HGOR, and the Springlake Civic Association Landscape Committee, over 100 trees will be planted in the coming weeks along Northside Drive. What's coming up? How can I get involved? Ribbon Cutting Ceremony for the new PATH: Join AMPC, City of Atlanta, PATH Foundation and other partners in mid November (date tbd) to celebrate the opening of the new trail around the Bobby Jones Golf Course. Details coming soon! AMPC/Trees Atlanta Forest Restoration Project: Join us on November 10, 2018 from 9 am to noon near the old playground location at Atlanta Memorial Park where we will continue removing invasive plants such as privet and kudzu in advance of our native planting in December. Please wear long-sleeve shirts, long pants, and closed-toe shoes for the work day. Trees Atlanta will provide tools and gloves. Email info@atlmemorialpark.org to let us know that you can join us! 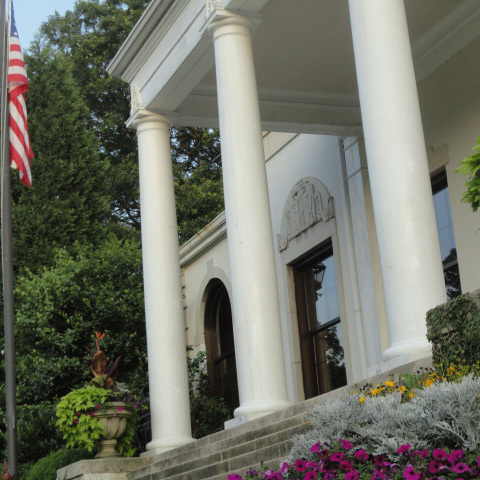 Renovation of the existing Bobby Jones Clubhouse: The City of Atlanta and the Recital Hall Foundation are finalizing the agreement for the Recital Hall Foundation to restore and repurpose the existing clubhouse into a small acoustical music venue with educational instruction. More information coming soon!